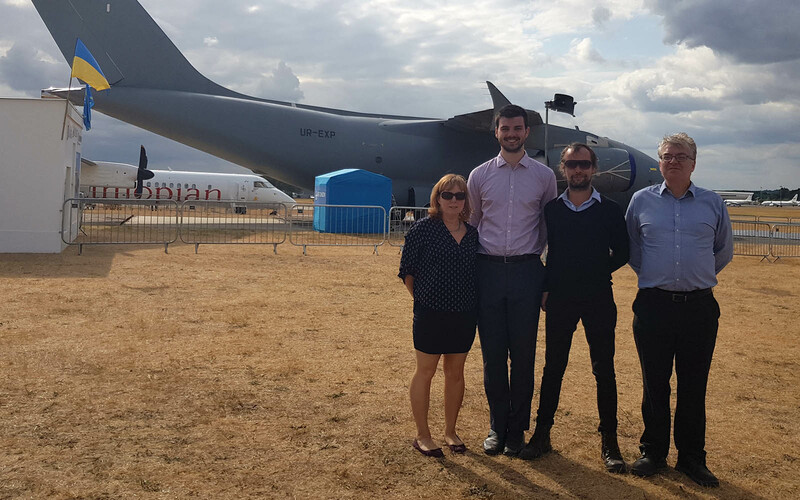 The Aerogility team attended Farnborough International Airshow in July 2018, one of the largest air shows in the UK, attended by approximately 100,000 aviation experts, admirers and enthusiasts on the trade days alone. Held every two years, the show features more than 1500 exhibitors from the civilian, defence and space sectors, all looking to show off their latest innovations and technology. And with four exhibition halls plus two feature areas, there were many exciting developments to take in! During the show, Phil Cole, senior consultant at Aerogility, met with Mark Thomas, editor of LARA magazine. Phil and Mark discussed the increasing recognition and interest that smart MRO planning is receiving from the wider industry. The show’s daily air display, a major attraction of the air show where the most advanced commercial and military aircraft are showcased, was another highlight for the team who especially enjoyed watching the F-35 Lightning and Typhoon flypast, as well as the displays from the Boeing 787, the F-16 and the Dornier 328 parachute display.